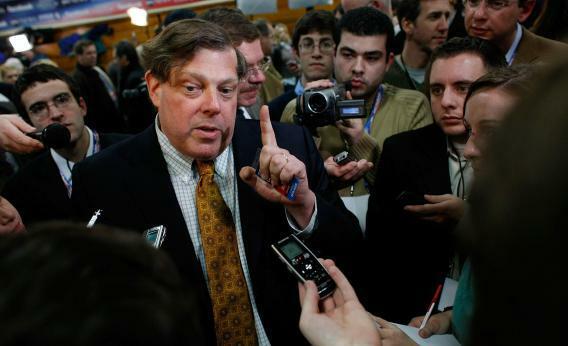 Scroogled and Mark Penn: The political consultant is lame, but he's not Bing's real problem. Mark Penn in Jan. 2008 in Manchester, N.H.
Microsoft’s “Scroogled” campaign of political-style attack ads against Google is pretty lame. Lydia DePillis places the blame for this lameness where it belongs: squarely on the shoulders of Mark Penn, who’s an incredibly rich and successful, yet totally lame former political operative. In a larger sense, however, I don’t think you can really blame Penn for Microsoft’s endless losses in various efforts to compete with Google. You have to consider the product! The problem with Microsoft’s online service offerings isn’t that their TV campaigns are lame. It’s not even that the products are bad. But they’re not wildly better than Google’s search and email and so forth. Most people are just incredibly lazy. It’s easy to forget, but it took Google Search and Gmail a remarkably long time to rise to dominance during a period when they wiped the floor with the competition on the merits. Now Google has that change-aversion and laziness working in its favor. To beat them, you have to crush them on quality. And Microsoft’s not doing that. No ad campaign can overcome the basic reality of human inertia. Not that I want to discourage them! I don’t use Windows or Office or Bing or Hotmail, but I do give thanks on a daily basis to Microsoft executives. Had they chosen to simply plow Windows/Office profits back into huge dividends, that would have been ideal for shareholders but bad for the world. Microsoft’s quixotic effort to challenge Google in its core competencies delivers, day in and day out, a level of market discipline and competition that’s invaluable to the world. In a sense, that’s the whole point of the Scroogled campaign. Google is extremely technologically impressive, but you do need to watch out because unchallenged their market power creates a lot of possible room for funny business. We need Microsoft out there offering an alternative.